Dr D Digs Up Ancestors: Is Dr D an Exact 111 Marker Match for Philip Dowell, Sr.? Cyndi's List announces a newly upgraded website. Is Dr D an Exact 111 Marker Match for Philip Dowell, Sr.? 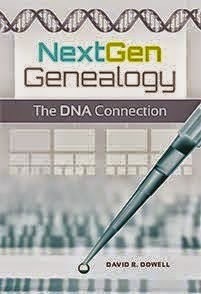 At the moment I am claiming that I am the one and only pure 111 marker Y-Chromosome descendant of my sixth great-grandfather Philip Dowell, Sr. who died in 1733 in southern Maryland. He is the earliest Dowell ancestor with whom I am convinced I descend. I want to brag about this before I am exposed as a pretender. So far only three Maryland Dowells who descend from Philip, Sr. have their full 111 marker test results back from the lab. Previously when we had 67 markers back on several of us, four descendants of Philip, Sr.'s son Peter, Sr., (including me), were exact 67 marker matches with each other. The four of us descend from three different sons of Peter, Dowell, Sr., who died shortly after 1800 in North Carolina. One likely descendant of Philip Dowell, Sr.'s oldest son, Philip, Jr., also is an exact 67 marker match for the four descendants of son Peter, Sr. Another descendant of Philip, Jr., is a 66/67 marker match and a third is a 65/67 match. The latter two descendants share one common mutation from the five of us who are exact matches with each other. This suggests that there were no mutations when Philip, Sr.’s DNA was copied and passed down to Philip, Jr. One living descendant shows no mutations. However, there was a mutation somewhere in the next two generations—a mutation shared by the other two of Philip, Jr.’s descendants who have been tested. John, Sr., the second son of Philip, Sr., has one living descendant who has test results for 67 makers. Over these markers he is a 63/67 marker match with the predominate pattern of the four descendants of Peter, Sr., and one of the descendants of Philip, Jr. However, on the one marker that the other two descendants of Philip, Jr. differ from the modal group, this descendant of John, Sr. matches the modal group. So, at least one descendant of each son appears to share that marker. This seems to establish that the marker values of the of the modal group are in fact what Philip, Sr.’s values would be if we knew where he was buried, dug him up and tested him. My next claim may be a bit tenuous since it is based on the results of only three descendants so far. These results are for the descendant of Philip, Jr. who had 2 mutations over the first 67 markers and two descendants of Peter, Sr. who are thought to have had no mutations over the first 67 markers. The three of us have identical marker values over markers 68 to 111 except for marker #100. On that marker, I and the descendant of Philip, Jr. match. He and I now match on 109 of the 111 markers—65 of the original 67 plus all the additional 44 markers. The other Dowell now only has conflicting values with me on marker #100. He is a 108/111 match for the descendant of Philip, Jr. Since at least one descendant of the other two sons of the original Philip, Sr. agree with my values of all 111 markers, I am claiming that my 111 markers are the genetic signature of my sixth great-grandfather. As more results come back, this assessment may have to be modified. However, for now that is my working hypothesis. Results for two more descendants are expected back in the next two weeks so stay tuned.